Every homeowner relies on their garage door to keep working day after day, but few pay much thought to the ongoing upkeep of this system. It’s vital to ensure that your door is properly looked after; without regularly maintenance checkups it’s easy for your garage door to develop serious faults. 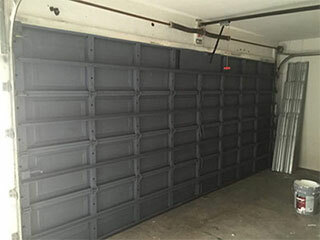 The average garage door opens and closes hundreds of times a year, and during the course of its life the many moving components involved in its operation will suffer wear and tear. As bearings become loose, joints run dry and sensors fall out of alignment, your garage door will begin to degrade. At this point, all that’s needed to keep your door in a perfect condition is a routine maintenance service appointments, where our professional technicians will assess the condition of your door and apply any required fixes. If the regular maintenance of your door is neglected, however, these small issues can easily develop into major problems; the cumulative effects of a lack of attention can combine to cause problems that aren’t easily repaired. That’s why we recommend homeowners have their door thoroughly checked over at least once a year - many door manufacturers also make this a requirement of their warranty. Our technicians have a great deal of experience in performing garage door maintenance, and know exactly what to look for. They’ll examine the cables, rollers, pulleys and springs that keep your door moving, as well as the electrical systems that allow it to operate safely - your opener, safety sensor and remote will all be thoroughly checked. We highly recommend investing in regular garage door maintenance, even if your door appears to be in perfect working order. You can never be too sure that your door isn’t developing any issues - contact our experts at Garage Door Repair Irvine to find out how we can help you.